Posted in: Art, Music, Photography. Tagged: 1882-1925, American, Brooks and Dunn, George Wesley Bellows, Nelson-Atkins Museum of Art, New Mexico, Pueblo Tesuque No. 2, Santa Fe, South of Santa fe. George Bellows spent the summer of 1917 mainly in California on a break from his teaching at New York's Art Students League. Pueblo Tesuque, No. 2 was painted on his return trip, when he visited in Santa Fe, New Mexico. 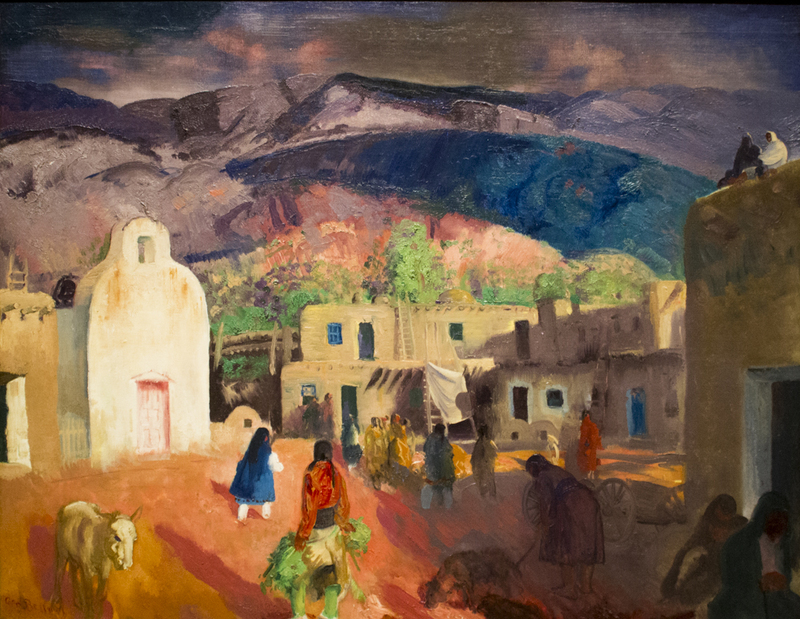 Tesuque Pueblo, near Santa Fe, offered Bellows the perfect opportunity to paint the Southwestern scenery and American Indian subjects that were increasingly popular around World War I. Bellows' composition depicts the daily life of the pueblo and includes its white adobe church on the left. A man dressed for the Green Corn dance, an annual rite of renewal prior to the corn harvest, adds an exotic air to the scene as does the highly keyed palette of purple, red-orange, green and blue. This is so vibrant. I love it, would hang it on my front wall!